Born: August 10, 1862, St. Louis, Missouri. Died: April 7, 1934, St. Louis, Missouri. Buried: Bellefontaine Cemetery, St. Louis, Missouri. Kroeger was a charter member of the American Guild of Organists; member the National Institute of Arts of Letters; conductor of the Amphion Male Chorus in St. Louis (1883-84); organist at the Unitarian Church of the Messiah, St. Louis (1886); director of the College of Music at Forest Park University (1887); president of the Music Teachers’ National Association (1896-97); president of the Missouri State Music Teachers’ Association (1897-99); instrumental adjudicator at the annual Kansas Jubilee (1900-03); master of programs in the Bureau of Music at the St. Louis World’s Fair, 1904; adjudicator at the Welsh Eisteddfod in Canton, Ohio (1906); and director of the music department at Washington University, St. Louis (1925-34). 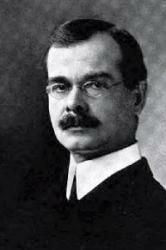 He also ran the Kroeger School of Music in St. Louis (1904-34). Successful American composer and teacher; born at St. Louis, Mo. He began studying violin and piano when he was five years old, and received his entire musical education in this country, principally in St. Louis, where he is located at present, and holds a prominent position as a teacher, pianist and composer. He is director of the College of Music at the Forest Park University for Women and is concert pianist of the Kroeger School of Music. Was president of the Music Teachers' National Association from 1895 to 1896, and of the Missouri State Music Teachers' Association from 1897 to 1899. Is a fellow of the American Guild of Organists and was master of programs of the Bureau of Music at the St. Louis Exposition in 1904. He has written a great many different kinds of music, and is one of a very few Americans who have published fugues. Mr. Kroeger says that some of his ideas are entirely musical, while others are attempts to illustrate poems in tones, such as his symphony, a suite, and overtures on Endymion, Thanatopis, Sardanapalus and Hiawatha. He has also published a very clever group of sonnets, on various themes; Twelve Concert Studies, which Hughes says "show the influence of Chopin upon a composer who writes with a strong German accent;" an etude, Castor and Pollux; a Romanze; and other studies. A Danse Negre and Caprice Negre resemble similar works of Gottschalk; and his Dance of the Elves is dedicated to Mme. Rive-King.